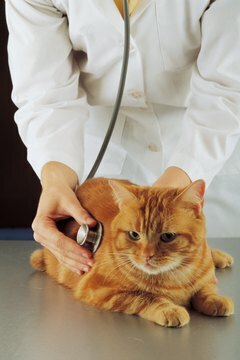 Can Cats Get Strep Throat? Your vet won't be asking your cat to say "Ahhh." Ugh. You know how you feel when you get strep throat. You might be surprised to learn that cats can and do get a version of streptococcus. But they don't get sore throats. Strep throat is caused by a group of bacteria known as group A streptococcus . This strep lives on the skin and in the throat. According to the Center for Disease Control, strep is transmitted through contact with infected mucus from a sick person or through contact with an infected wound or sore on the infected person's skin. Many types of strep exist; some have no symptoms, others can be fatal. The CDC considers strep throat mild, even if you don't think it is. Group A streptococcus can become "flesh-eating disease" and toxic shock syndrome in rare instances. Animals, including cats, can get various forms of streptococcus. One form, Streptococcus Canis, can act much like group A streptococcus with upper respiratory infections, sinusitis, "flesh-eating disease" and something much like toxic shock syndrome. It's extremely rare for a cat to pass strep to her humans, and vice versa. It's terribly unlikely your cat will contract strep from you should you have the misfortune of getting sick with strep throat. If your kitty comes down with strep, chances are she's going to be feeling under the weather. Fever, stiff joints, coughing, pneumonia, pain, lethargy, sores and abscesses are typical symptoms of strep in cats. If your cat gets strep or shows any of these symptoms, bring her to the veterinarian immediately. Your veterinarian will most likely treat her with antibiotics. Don't wait for it to become worse. The longer strep goes without treatment, the harder it is to treat. Cat most susceptible to strep are kittens, elderly cats, cats with immune system compromises such as feline leukemia or kitty AIDS, and cats in overcrowded and high-stress situations such as shelters, catteries and boarding kennels. Keeping your cat away from exposure to diseases is the best way to prevent her from getting sick at all. Do Cats Get Along With Parakeets? Can Having Cats in the House Affect Your Pregnancy? Can a Kitten Get Stuck in an Engine? Can Kittens Catch Mono From Humans? How Do Cats React to Human Death? Do Tabby Cats Get Along With Dogs?